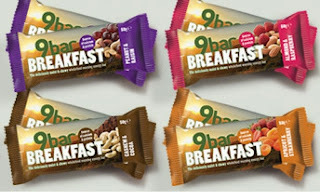 9bar have just launched a new breakfast bar range. 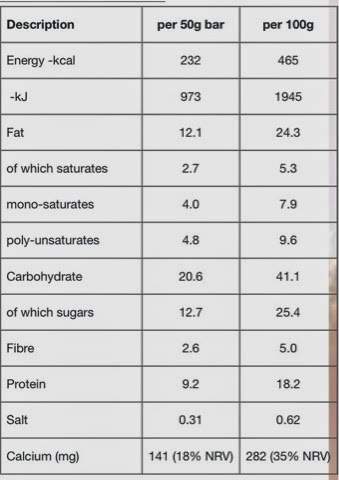 I eat the original bars (peanut and fruity are my favourite) during long runs and on ultras as they are easy to digest; the seeds have slow release carbs for a constant energy supply and they have a decent amount of protein to feed the muscles. I was very excited to receive some samples of the breakfast range. 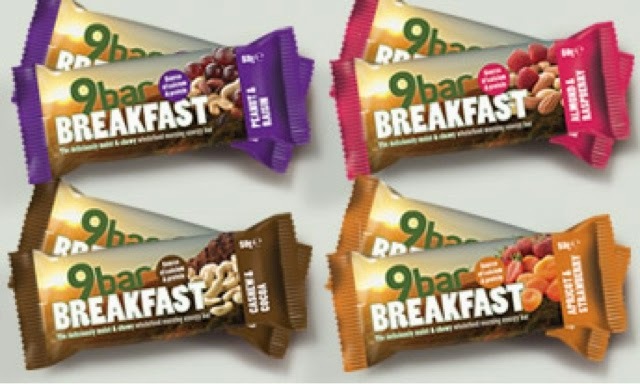 The original 9bars are around 50% seeds/nuts, the breakfast range is around 25% with gluten free oats and soya protein crispies replacing the seeds. Instead of honey or golden syrup as in the original range rice syrup and agave nectar has been used. All varieties are wheat and gluten free as well as being vegetarian society approved and vegan. The photo shows almond and raspberry. The texture is a cross between cereal bar and flapjack. All flavours are moist as well as quite chewy but not chewy and hard work like a protein bar. 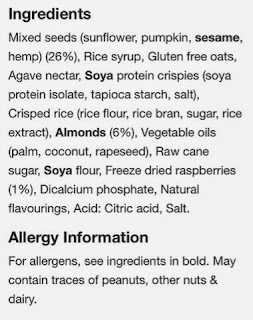 Full nutritional information on each flavour is here http://www.9bar.com/shop/category/breakfast the photo shows information for almond & raspberry but in brief they are all similar and have around 230 calories per 50g bar, 9g protein, 2.5 g fibre and 17% RDA calcium although the amounts vary for each flavour. 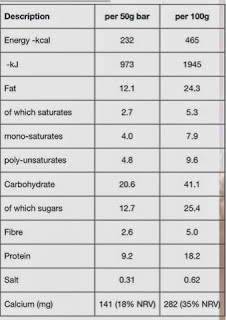 For comparison weetabix breakfast bars contain the same calories, half the protein less sugar and fat. 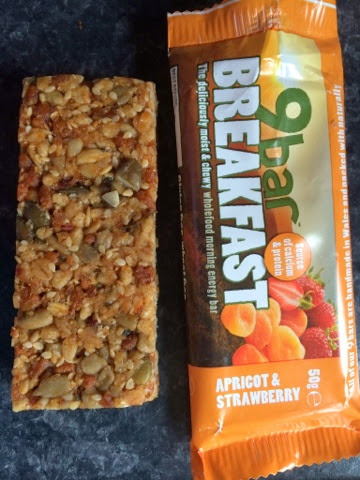 As the main ingredients in these are seeds/gluten free oats they are slower release so keep you full for longer, they are also a lot more filling so don't leave you reaching for another snack an hour later. 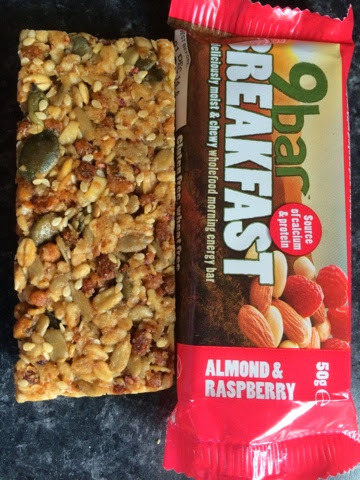 My husband is not too keen on 9bars, he says they are 'too healthy' and doesn't like all the seeds. 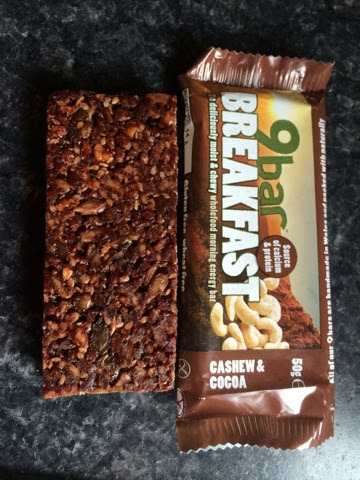 When I told him about the new bars he was not that interested as he thought it was just going to be another health bar but when he tried them he was pleasantly surprised and loved them too - the seeds were disguised enough for him not to notice! I think I will need to hide these! Wow, these are gorgeous, I didn't think a healthy bar could taste so good -it's like Bakewell tart. 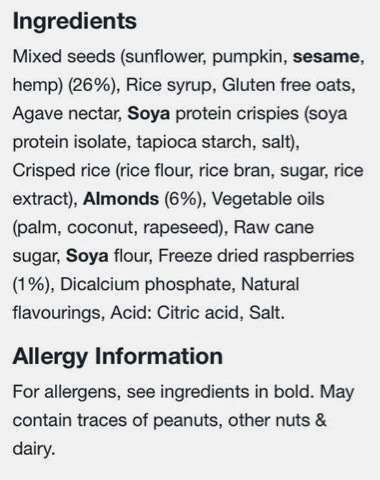 I am not that keen on raspberries so initially was dissapointed to see raspberry had been combined with almond (one of my favourite flavours). However, I was pleasantly surprised - almond is the strongest taste with the raspberry being quite subtle. 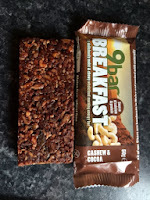 I can imagine these being a top seller, I hope wholebake can keep up with demand; my new favorite snack of all time (apart from a chocalate bar!). I am a big chocolate lover so was especially excited about this coco flavour with (vegan) dark chocolate chips it didn't dissapoint. For breakfast sweetness is just right. If you don't like cashews don't be put off as the chocolate flavour hides them yet you still get their goodness. For an afternoon snack I would like more chocolate chips but that's because I love chocolate. 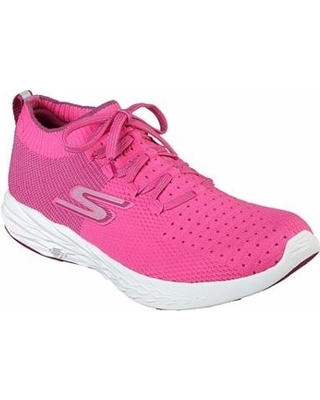 Having said that they are really nice and a close second. For a healthy chocolate bar alternative this is as good as it gets without all the fat and sugar. I like strawberries but am less keen on apricots although I like the flavour. Apricot was the stronger than strawberry, so if you like apricots this is for you as it was a good apricot taste. I liked it but prefer the above two; that is just my taste though. My mum loves apricots but is on holiday so I couldn't get her opinion! 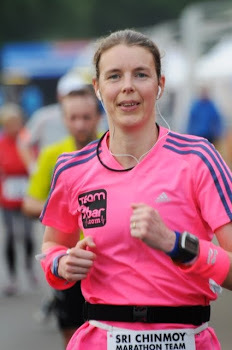 This was ranked 4th by both of us although having just had another might be pushing it up to 3rd. You can taste the raisins but don't really notice the peanuts. 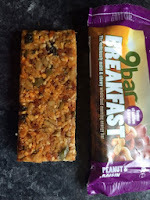 There is no strong flavour (which is why we ranked it 4th); just a nice moist chewy bar. For people who don't like such strong flavours or chocolate then this is the one. 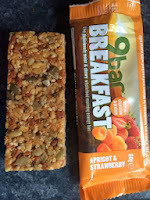 It would be ideal if you struggle to get breakfast down on race morning or want something plain. I think this is the safe flavour which everyone will like; no one will dislike but it will probably not be the favourite for many people.